Kotobukiya is branching out into an all new statue concept with Ikemen. Similar to the popular Bishoujo series, this fantastic expansion is a lineup of popular characters re-designed by the famous Japanese illustrator Ricken in the Japanese Ikemen (“handsome men”) style! The third IKEMEN to join the lineup is Batman’s third sidekick, the Red Robin Tim Drake! 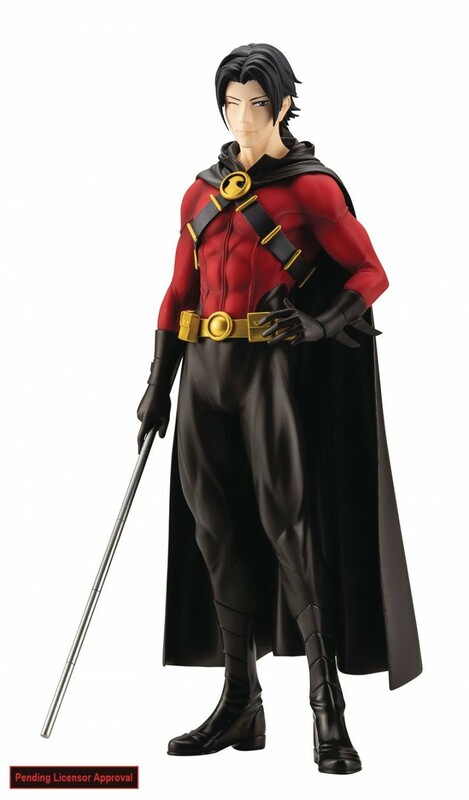 The high level of care taken in the sculpting of Tim’s youthful and toned form makes this IKEMEN a must for all Red Robin fans, and the subtle details of his eye?catching red costume are expertly recreated with a stunning paint job. The statue comes with an interchangeable head, allowing you to display Tim with our without his mask! Additionally, the 1st edition of the statue will come with a bonus face part allowing you to display Tim with a more serious expression that provides a nice contrast with the original lighthearted smile on the default face part. Collect all of the different generations of Robin and display them side by side to fully evoke the unique dynamic of the Batman family! NOTE: The “serious face” part will only be included with the 1st edition of the product and will not be included in later reproductions.